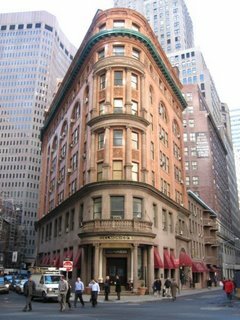 What’s interesting about Delmonico’s? Simple: it’s the oldest continuously run restaurant in the US, and may be the first fine dining establishment in the whole country, having been established in 1827. Those pillars outside? Imported from Pompeii in the 19th century. This is where Lobster Newburg, Chicken a la King and Baked Alaska were invented; the restaurant also gave its name to the Delmonico steak, a cut served in restaurants all over the country. (They also claim to have invented Eggs Benedict, but this seems to be controversial.) Mark Twain has eaten here – so have Theodore Roosevelt, Dickens, Oscar Wilde, Tesla, Napoleon III and a positive galaxy of America’s great and good. We booked for a Wednesday night, put on those clothes we’d been able to afford because we didn’t go to Kobe Club, and got stuck in. The dining room is very masculine; all dark leather and wood panelling, like a meaty gentlemen’s club. Service was smiling and fantastically personal – my cocktails, including the most savoury and well-balanced Dirty Martini I’ve ever tasted, were constructed at the tableside in a silver shaker. The menu still includes some of the classic dishes from the restaurant’s past, although I was disappointed that there were no Delmonico Potatoes – a gratin made from parboiled potatoes grated into long shreds with parmesan and nutmeg. That famous steak was there, though, along with the Lobster Newburg and Baked Alaska. Dr W plumped for a Caesar salad to start with so he could fit in as much steak as possible later on. It was a good example, dressing clearly made in-house and strongly flavoured, with white anchovies interlaced on top. I went for the foie gras, dusted with crushed hazelnuts and grilled, then served hot with three fruity sauces. The crushed nut/foie combination is one that pops up more and more often these days, and it’s a good one, the toasty richness of the nuts complimenting the buttery foie beautifully. This little lobe was nicely and neatly prepared, too; no stringy or bitter bits. The Delmonico steak (a wet-aged, boneless ribeye) was thick, and served perfectly medium rare; it was gently crusted on the outside, the fat crisping and delicious, and marbling the whole piece. It was also enormous, weighing in at 20 oz, and I wasn’t able to finish it, which made me extremely jealous of Dr W, whose salad decision was a good one which enabled him to absorb his entire steak into his person. Spinach and parmesan and something called “The Perfect Hash Browns” made for good sides, although I’d quibble with the “perfect” thing; they weren’t particularly interesting or memorable. It is a happy freak of biology that I appear to have been born with a separate stomach especially for dessert. I couldn’t have packed another atom of beef in there, but Baked Alaska (two spoons, because Dr W was so full that tears were appearing in the corners of his eyes) sounded just the ticket. And where those hash browns hadn’t lived up to their description, the Baked Alaska was pretty much divine. A piped hedgehog made from tens of caramelised meringue peaks surrounded a soft, but not melting centre of gorgeous, gorgeous banana-candy ice cream, sat on top of a piece of sponge studded with juicy pieces of apricots. Regular readers will know that I’m not much of a pudding person, but I would be perfectly happy to eat Delmonico’s Baked Alaska and nothing else for…ooh…at least one meal every day. It is a happy freak of biology that I appear to have been born with a separate stomach especially for dessert. This is an instance of the well known phenomenon whereby a satiated organism will resume appetitive behaviour on presentation of a novel stimulus (So Dr W would seem to be somewhat atypical in this regard). The phenomenon also extends to sexual behaviour, in the context of which it’s known as the Coolidge effect, after an incident involving the eponymous President and a cockerel which I must recount to you some time. This clearly needs further investigation, Helen, and it strikes me that I haven’t seen you in ages – where around here has a good dessert menu? Drat – I’d heard rumours of that but vaguely remembered having heard similar, but untrue, rumours previously, and their website suggested ongoing-ness, if not exactly up-to-date-ness. Well, I don’t know, then. The place that used to be The Vaults? The place that used to be La Raza? You know? you could have gone to Kobe Club and have almost the same menu items you had a Delmonico’s and not pay much more ( Or maybe even less)? Went to their respective websites and found what you had at Delmonico’s you could have had at Kobe for $169 ( Food only) if you had two of their 20 oz AMERICAN PRIME ribeyes ( does Delmonico’s serve American Prime??) or if you would have had their huge Charlie Sizling Steak for Two you would have ended up paying $121…and that inludes the same appertizers, sides and dessert you had at Delmonico’s, plus their complimentary Kobe Hot Dog Pigs in a blanket style “Amuse” and endless baskets of their incredible cheese and truffle Pop-overs. If you don’t order their Wagyu ( Kobe, which by the way, its worth paying more for 4 oz than less for 20 oz), Kobe Club fares equal to any lesser famed steakhouse. Cripes – consider me told. That’s *stinging*. Sounds like a great place, but I have one small quibble. The place can’t be continuously run since the original Delmonico’s closed in 1923. Still, I must eat there one day.